“At least it’s easy to pull,” she grumbled, tossing a plant into the wheelbarrow. She put a sprig of portulaca into her mouth, chewed, and smiled. “Take that, you heat-loving weed,” she said. 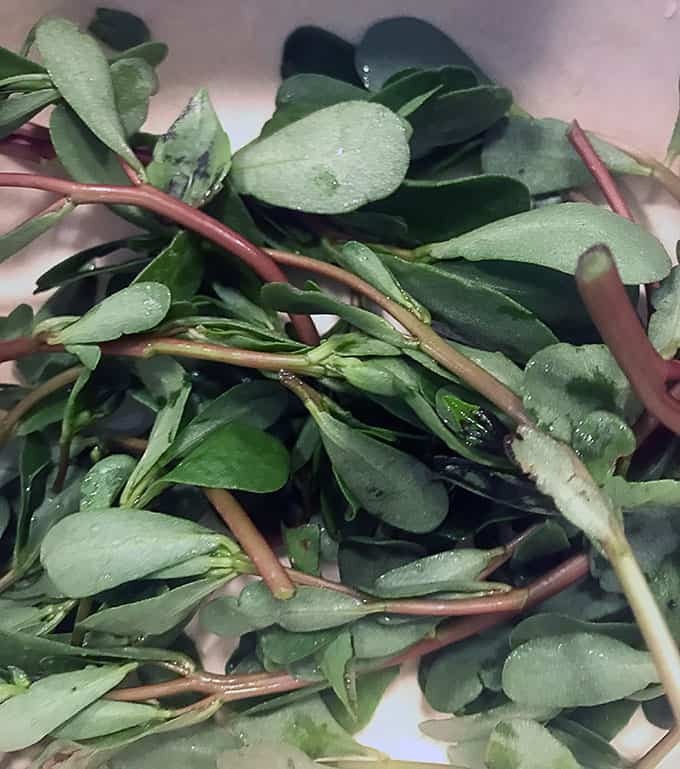 Type of Plant: Common purslane is an annual weed, although some varieties of this plant are grown for ornamental value. You can grow Portulaca with colorful flowers from seed, six packs or in pots…if you’re looking for a very heat and drought tolerant annual, look at the beautiful varieties from Proven winners. But the weed just appears in hot, dry places. Give those weeds a bit of moisture or good soil and you’ll have a large, succulent plant. Why I Love/Hate this plant: OK…I hate that I’m having to pull small, mean Portulaca oleracea out of the cracks in my patio right now, and that it grows vegetable garden with such vigor that it’s impossible to see the baby carrots. But this plant is higher in Omega-3 fatty acids than many fish oils are, and that it’s an excellent source of vitamin-A and C, not to mention dietary minerals such as iron, magnesium and potassium to name just three. And you can eat this portulaca raw or cooked. 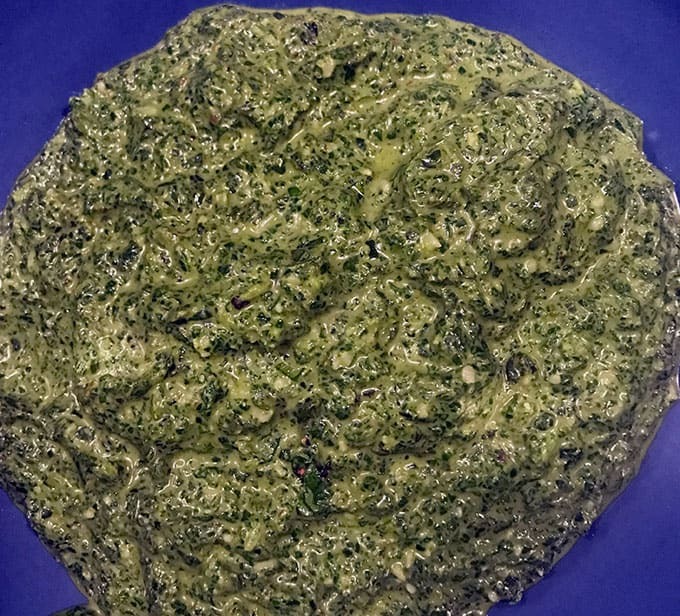 Add it to salads, toss it in your stir-fry or even use it with basil and arugula to make a delicious pesto. A Word to the Wise: This is a weed. In other words, it will try to take over all open, sunny spaces. So don’t let it go to seed…edit it out, pick it young, and pull any that you won’t eat before it flowers. You’ve been warned. For most recipes you’ll want to either pick the leaves off of the stems or only use the tips so that the stems included are the youngest and most tender. For the pesto, I included leaves and tip stems. For salad I frequently just cut the tips off of the ends of the new growth. For the pesto I put two cloves of roasted garlic, three tablespoons of olive oil, and about three cups of arugula leaves, two cups of basil leaves and two cups of purslane tips into the food processor. Once that was well blended, I added two tablespoons of half-and-half and a quarter cup of parmesan cheese. 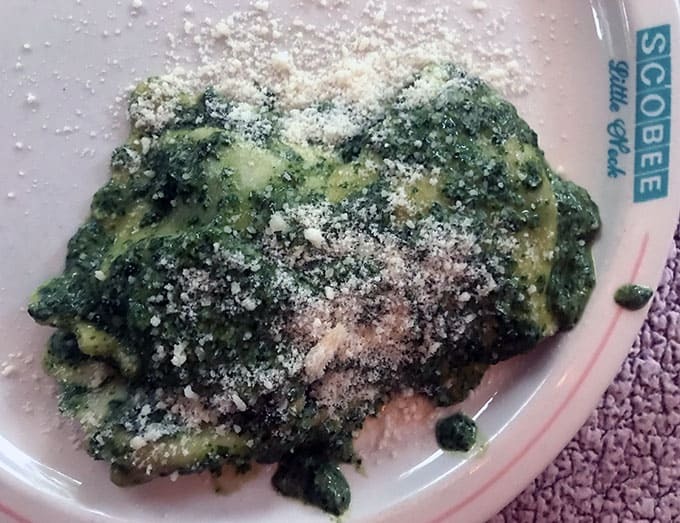 We used half of the pesto for ravioli that night, and we used the rest of the pesto as a sauce on steamed green beans the next night. 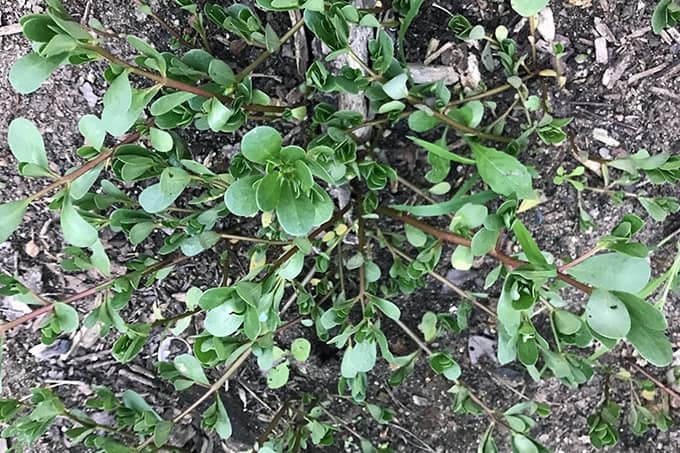 Purslane grows close to the ground and looks like a succulent. It’s easy to pull or hoe out of gardens. Keep on it…but save some to eat! I just yesterday (!) pulled a whole lot of them out of my garden and threw into the compost! Silly me. Now I will know better and try eating them. No worries, Margot….they’ll be back!